Good Housekeeping: Brownies! 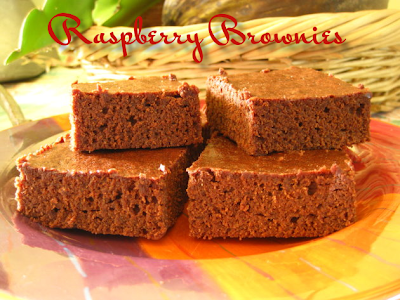 says that "raspberries and chocolate are a lovely combination. We suggest using seedless raspberry jam, but if you have raspberry jam with seeds in your pantry, press it through a coarse sieve to remove the seeds." 1) Preheat oven to 350F. Grease 13" by 9" baking pan. In small bowl, with wire whisk, mix flour, cocoa, baking powder, and salt. 2) In 3-quart saucepan, melt butter over low heat. Remove from heat. With wire whisk, stir in sugar. Add eggs, one at a time, beating well after each addition. Stir in jam and vanilla, whisking until well mixed. With wooden spoon, stir flour mixture into butter mixture just until blended. Spread batter evenly in prepared pan. 3) Bake until toothpick inserted 2 inches from edge comes out almost clean, 30 to 35 minutes. Cool in pan on wire rack. 4) When cool, cut lengthwise into 6 strips, then cut each strip crosswise into 6 pieces. Ooooh yummy! I love chocolate and raspberry together! Very interesting! I adore raspberry & chocolate together!